Although he is scarcely more than a name, working-class Lyon has long celebrated the life of the "virtuous canut" Denis Monnet. Pierre Charnier, leader of the early 19th-century workers' movement and founder of "Mutuellisme" chose to live in the same quartier, rue Peyrollerie, now the Quai Pierre Scize. In 2011 Monnet was commemorated on the Left-wing Lyonnais website REBELLYON (great pun!) - see refs. below. It is no doubt convenient to have a popular Revolutionary hero other than politically-loaded (and in any case pretty crazy) Joseph Chalier. The only problem is, Denis Monnet was on the wrong side. He was not a Jacobin; he fought for the Lyon Federalists (and therefore the bourgeoisie) and was guillotined in November 1793 when Revolutionary forces regained control of the city. He was executed "unjustly" say the modern commentators; but are they right? There is almost no information. Monnet was born in Aix-en-Provence in 1750 and apparently had some legal training before becoming a silk weaver, but under what circumstances we do not know. He had qualified as a master weaver by 1786 so at this point he had been in the profession for at least five years. He was poor, for in 1790 he did not pay sufficient tax to qualify as an éligible in the Lyonnais municipal elections. In November 1786, following the August protests, Monnet was arrested and accused of seeking to revive agitation by circulating appeals for another strike and by providing a "rallying point" for the weavers. After two months' imprisonment he was released without being brought to trial but was now firmly identified as a spokesman for the weavers' cause. 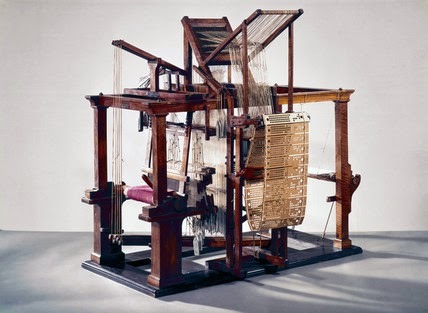 1789 was the highpoint in the struggles of the weavers of 18th-century Lyon. 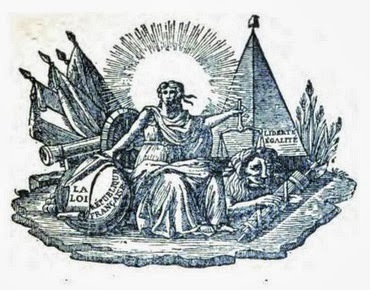 In February the Grande Fabrique, in common with other guild organisations, was designated as a primary assembly for elections to the Third Estate. The master weavers took advantage of their superior numbers to exclude merchants from their delegation of electors; they howled down the opposition and returned only weavers, "above all the most turbulent ones"- among them Denis Monnet. (see Wahl p.55-57) Their representation was subsequently whittled down, but a new spirit of confidence prevailed and demands were renewed for a just and binding tarif. 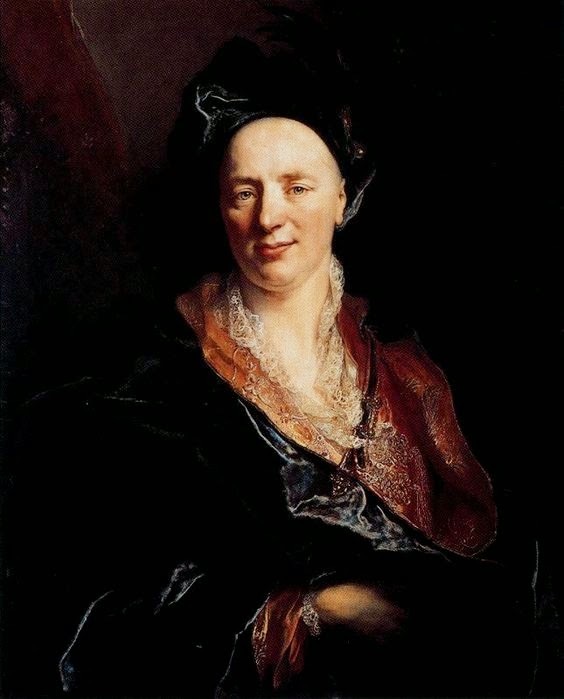 Monnet and a few associates organised a protest lobby, drew up petitions and in April even travelled to Versailles to press the weavers' case, with the result that by the end of 1789 they succeeded in clawing back the legal framework for a tarif guaranteeing better wages. The "Patriot" municipality which unseated the municipal oligarchy in 1790 was also sympathetic. On May 5th 1790 Monnet was elected by acclamation to preside over a meeting of thirty-five maîtres-fabricants which took place in the Cathedral, expelled merchants from the corporation and chose him as their maître-garde. Mémoire of the silk-weavers of Lyon, 1790 - probably composed by Denis Monnet. From1790 onwards the suppression of the guilds and the onward momentum of Revolutionary politics tended to subsume the interests of the silk weavers in the wider popular struggle. Monnet remained committed to the Revolutionary cause. In December 1790 he created a stir and gained credence with the Lyon "patriots" when he denounced a supposed counter-revolutionary conspiracy - apparently he had been approached to entice his "followers" into rebellion on the mistaken grounds that workers in a luxury industry would see salvation in the royalist cause. 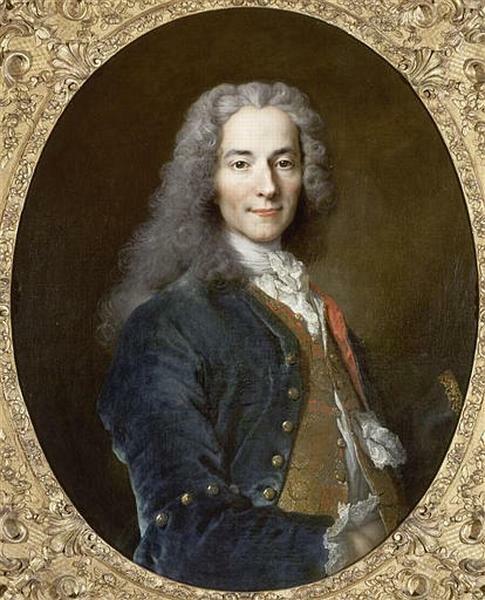 Meanwhile he was active as president of the Port Saint-Paul sectional assembly, campaigning against the octrois and demanding harsh penalties for those who protested against the Civil Constitution of the Clergy "on the vain pretext of religion". A pamphlet printed by the popular society of the Saint-Vincent section praised him as champion of the silk workers and guardian of national liberty. At this time too Monnet was drawn into more elevated Revolutionary circles as the protegé of François Billemaz, juge de paix, friend of Roland, and leading light in the patriot club movement, who engaged him as his secretary and published a lengthy eulogy of his civic virtues. In November 1791, with the Rolandists in the ascendant, he was elected as a notable to the municipal council. Despite the subsequent shift away of popular support , Monnet remained loyal to the Rolandists. Having lost all office for a time, he re-emerged as president of the Port Saint-Paul section, where in May 1792 he secured the election of anti-Jacobin candidates onto a new sectional comité de surveillance. According to Bill Edmonds, Monnet's viewpoint challenges the simplistic identification of "Federalism" as a bourgeois or anti-populist movement. His example was not in fact so unusual but reflected the division and complex conflict which cut across the popular movement and resulted in the spread of anti-Jacobinism to nearly a third of the sections of Lyon by February 1793. The documents reveal Monnet's horror of Jacobin revolutionary improvisation, of uncontrolled popular violence and confiscatory taxation, and his identification of Lyon's troubles with the arrival of Chalier. In his eyes, the Rolandists represented respect for constituted authority and a fruitful co-operation between elected magistrates and popular societies. In Lyon it was the Federalists rather than the Jacobins who were the champions of sectional permanence and direct democracy. No doubt the Federalist ideal masked an element of bourgeois control over the municipality, but there were also genuine popular gains such as the democratisation of the National Guard - culminating in the election of a weaver Joseph Juillard as commandant-général in March 1792. Denis Monnet was executed on 27 November 1793 (8 frimaire Year II) He was 43 years old. Articles from REBELLYON, a Lyon-based "anti-authoritarian" web-journal:. 5th May 1790: the canuts decide to govern themselves! 27th November 1793: the virtuous canut Denis Monnet is guillotined. Immensely populated, Lyon has always been split between a great number of privileged rich and oppressors, and a much greater number of poor, crushed beneath the weight of charges, demeaned by humiliation. (Joseph Chalier, Declaration to the National Assembly, 1792). Ancien Régime Lyon is seen with some justification as providing a precocious example of the collision of class interests characteristic of industrial society. 19th century Lyon was notorious for the radicalism of its factory-based weaver, the "canuts, and it is abundantly that, despite the tradition artisan context, the canuts had their forerunners in the 18th century. Certainly by 1789 the bourgeoisie of Lyon already had cause to fear the insurrectionary potential of aggrieved and desperate silk workers. 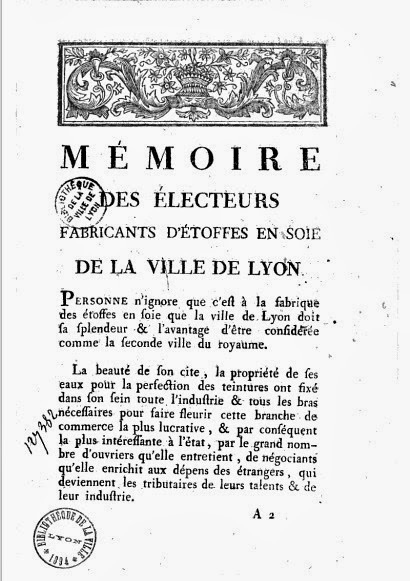 In the course of the 17th and 18th centuries, the status of the independent master weavers of Lyon had suffered progressive erosion as the industry came to be dominated by wealthy entrepreneurs who secured commissions in bulk, signed contracts with selected workshops and sold finished fabric on a wholesale basis. Raw silk would be purchased from dealers in Italy or sometimes from the French provinces of the Vivarais and Bas-Languedoc. The maîtres fabricants found it increasingly prohibitive to work on their own account and came de facto to be regarded as a labour force to be paid in accordance with market prices. 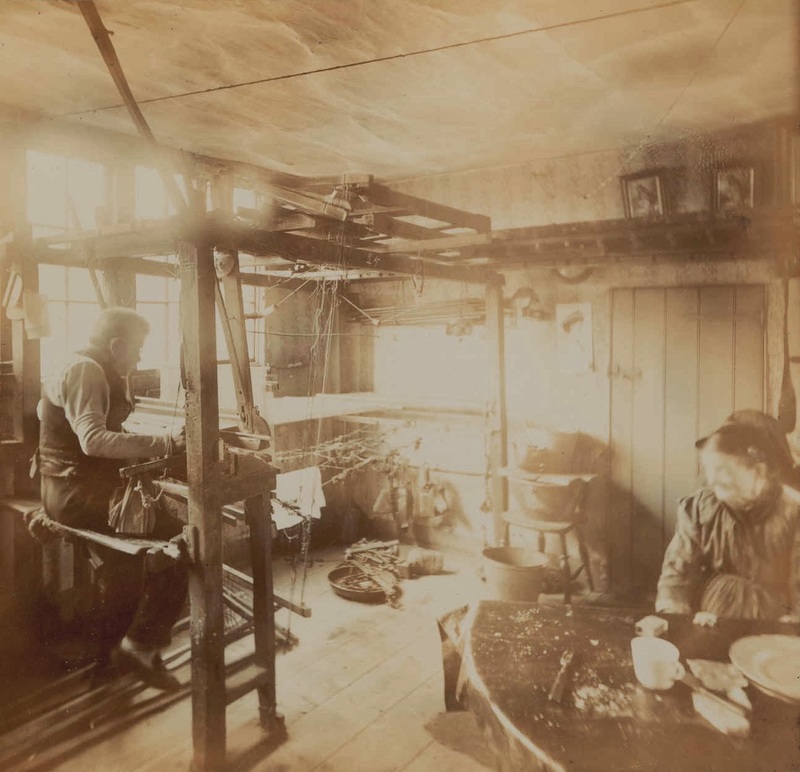 Whilst the number of independent weavers decreased sharply during the 18th century, the number of subcontracted workers, still called masters, rose to over seven thousand. This was not a change which happened without conflict. The framework for protest was provided by the the guild, the archaically named Communauté des maîtres marchands et maîtres ouvriers fabricants en étoffes d’or d’argent et de soie [known also as La Grande fabrique] which had originally been set up as long ago as 1554 as a royally regulated artisanal corporation. 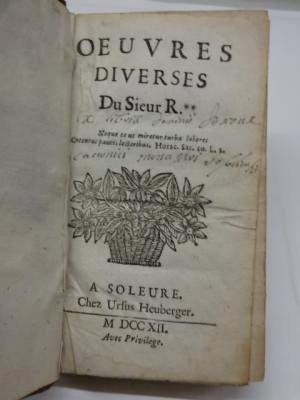 From 1619 the silk merchants who came to dominate the trade were themselves obliged to become members of the guild, (though dispensed with skill requirement) and were known as maîtres marchands. In 1667, under Colbert, the original Règlement was revised in their favour,forcing weavers to submit to a system of certification for completed contracts and laying down a standard piecework rate (the prix de façon). 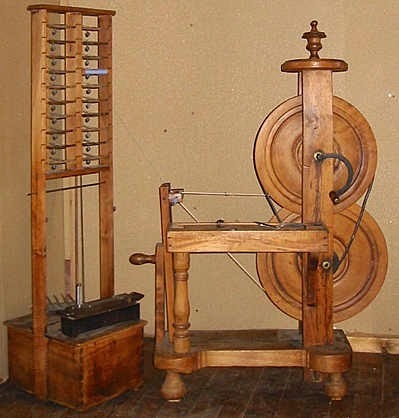 In the 18th century the merchant members also came to dominate the offices of the guild: In 1707 fees were imposed on weavers wishing to sell directly on market, which in 1712 were raised to prohibitive extent - only 113 master weavers were able to meet this charge and maintain their independent status. 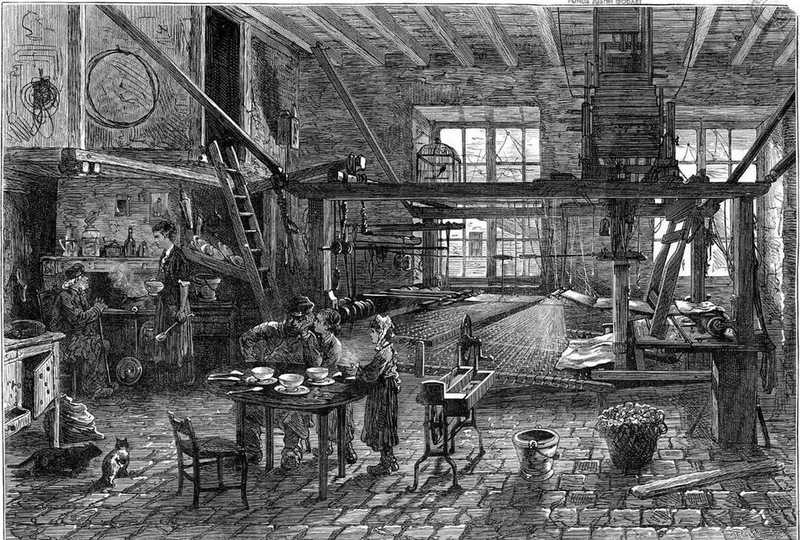 In 1731 the number of looms they could operate was restricted to two (whereas weavers working for merchants might have four). The first major collision took place in 1744. In 1737, thanks to the sympathetic policies of Philibert Orry as controller general of finance, the weavers had secured some revisions in their favour, but in 1744 a new set of guild regulations were published which annulled these concessions and once more reinforced the power of the merchant members. Behind this move were government reforms led by the new royal inspector of silk manufactures, Jacques Vaucanson, who had ambitions to rationalise the entire French silk trade under the control of Lyon merchants running giant silk throwing mills, designed on modern factory lines. Publication provoked a popular uprising, from 3rd to 6th August 1744. 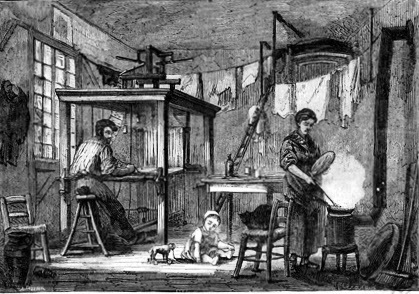 Weavers ceased work and pillaged the homes of several merchants. The prisons were thrown open, notables fled from the city and in the course of the week perhaps 15,000 rebels took to the streets. Vaucanson was forced to flee to Paris disguised as a capuchin and the Prévôt des Marchants was temporarily obliged to reinstate the règlement of 1737. Royal repression swiftly followed, in the course of which one weaver was hanged for sedition and four more sentenced to the galleys. In February 1745 the arrêt of 1744 was finally imposed, and, apart from Turgot's shortlived suppression of the Grande Fabrique in 1776, was not to be substantially modified until the Revolution. 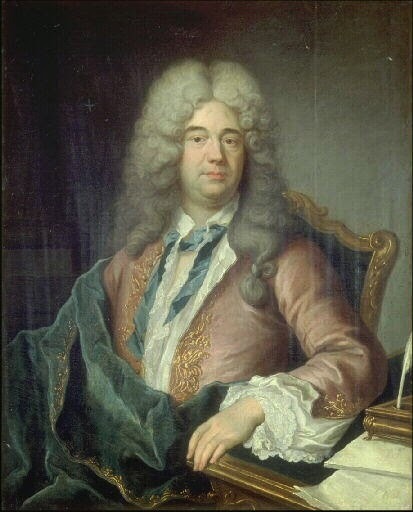 By setting an elevated fee for admission to mastership the new rules laid down with clarity the barrier between maîtres marchands and "workers" (artisans and compagnons); as a declaration of 1753 put it, "the state of merchant and that of worker ("l'ouvrier") must be distinguished from one another". Already, then, by 1744 weavers were prepared to take to the streets in violent collisions. Henceforth they were forced to accept their position as waged workers and aims centred on improvements in piece rates for work done. Whilst trade expanded their situation, though diminished in status, was tolerable, but from the mid-century onwards declining markets for silk brought hardship and, with it, renewed threats of unrest. A serious slump in trade drove down de facto rates, whilst traditional municipal reliance on the octrois - taxes on staples brought into the city - meant that the price of food and other necessities remained high. Agitation now focused on need for binding increases in payment and a just tarif (ie. a table of guaranteed piece-work rates) Petitions multiplied for the upward revision and enforcement of the prix de façon. The rising of 1786, just a few years before the Revolution, cut across several industries. Unlike the protest of 1744 it was the product of poverty and desperation. In August 1786 after several months of unrest, artisans in a number of trades - hatters, pastry-cooks and carpenters as well as silk workers - threatened by an increase in wine prices, stopped work. Agitation rapidly centred on the silk workers and their demand for a doubling of the prix de façon from 2 to 4 sous per aune of fabric (hence it became "l’émeute des deux sous"). The weaver's strike was powerful enough to persuade the local authorities to endorse a new tarif at the end of August but in the end repression was swift and merciless. Three strikers were hanged and not only was the new tarif quoshed but the piecework scales abolished. leaving the weavers entirely without protection. Recourse to collective action once again led only to reinforcement of the merchants' position, with the inherently unequal system of bargaining piecework rates officially incorporated into royal legislation for the first time. The disturbances of 1786 were followed by alarming decline in the fortunes of an already ailing industry. Finished cloth stockpiled in merchant warehouses and the harsh winter of 1786-87 destroyed most of Italy's mulberry plantations. By Spring 1788 the municipality estimated the number of unemployed at twenty-two thousand. 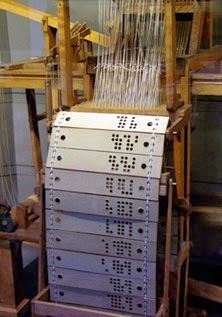 Perhaps half the city's looms idle and many of the rest were devoted to poorly paid silk "plaincloth". On the eve of Revolution, Lyon was already an economy in crisis, with a desperate and volatile workforce ready for change. 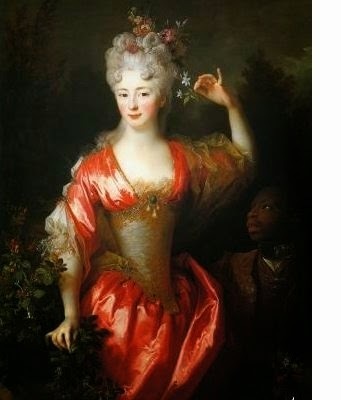 "The eighteenth century was of one of the most spectacular periods of silk production in France. 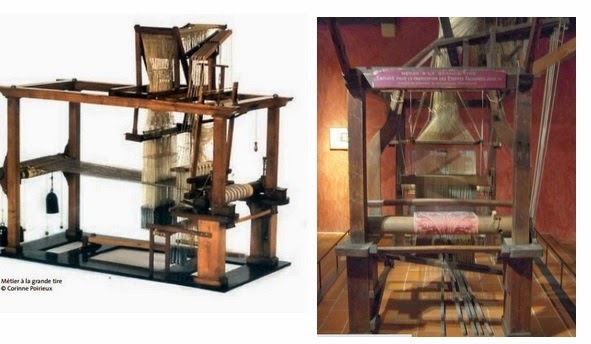 Due to regulations initiated to improve the quality of cloth produced during the reign of Louis XIV (1643-1715), silk manufacturing centres such as Lyon were able to capitalize on advancements in weaving technology to create luxurious textiles that were vital to the French economy." "Early eighteenth century silk design is marked by the evolution of textile motifs towards greater naturalism. While floral ornamentation had consistently appeared in Medieval and Renaissance silk decoration, these forms were heavily stylized. Semi-naturalistic flowers begin to appear about 1700, after which a tendency towards more naturalistic forms accelerated until the middle of the century. The beginning of the eighteenth century is also noted for the production of "Bizarre silk named for the asymmetrical arrangement of exotic motifs and odd color combinations. The resulting informality of "Bizarre Silk" patterns greatly complemented the increasing naturalism in design." 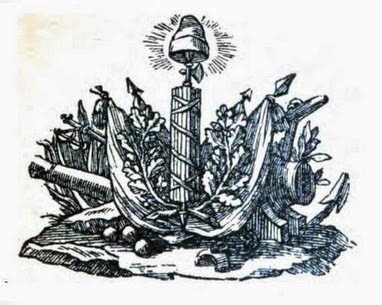 Design attributed to Jean Revel. During the 1730s, an entirely new style developed marking a dramatic shift in French silk design. 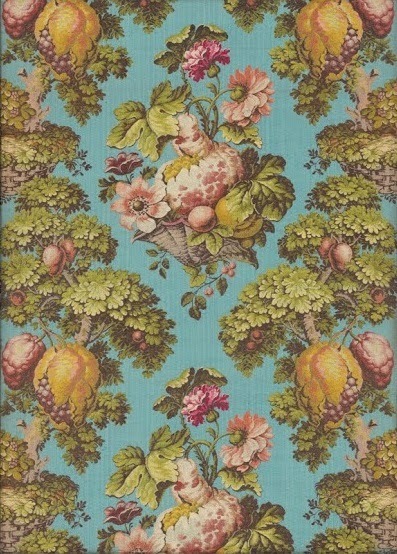 Silks of the 1730s are characterized by large and completely naturalistic fruits and flowers often depicted in relief. 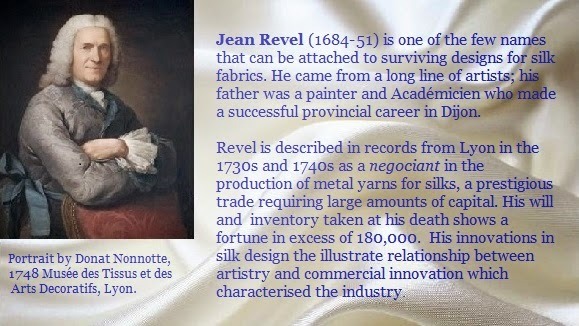 This new style can be linked to the beginning of the career of Jean Revel (1684-1751) one of the most renowned and technically sophisticated Lyonnais silk designers. Revel and other contemporary silk designers also focused considerable attention on how textile motifs were rendered in thread. Instead of depicting flat, single coloured motifs, designers of the 1730s conceived motifs more three-dimensional in appearance through shading or gently blending contrasting shades of colour. 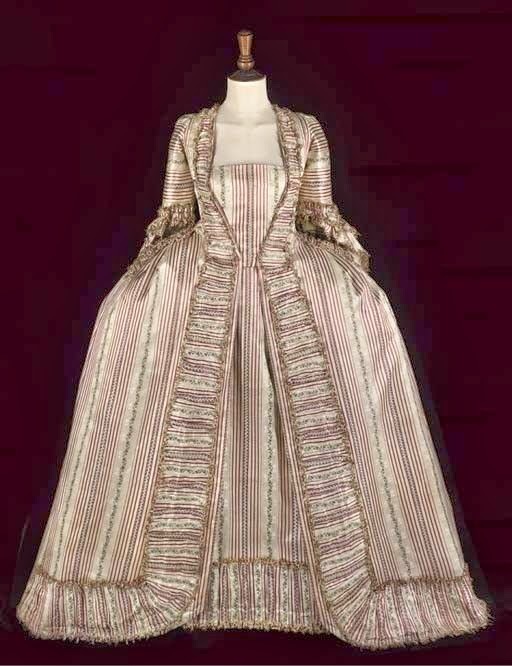 "Having developed naturalism to its fullest extent in the 1730s, silk designs of the 1740s and early 1750s returned to a more stylized manner of depicting forms, a trend that continued through the end of the century. The scale of fruits and flowers also diminished and silk designers played with a lighter composition by organizing meanders of flowers, ribbon, lace or fur patterns across the fabric. While meanders of the 1740s tend to flow more freely through the space of the fabric, meanders of the early 1750s are more static in nature. The light hearted charm and vigour that develops in silk designs during the 1740s is characteristic of mid-eighteenth century Rococo silk production". "Although the designs are not as stiff as their predecessors, silks of the late 1750s and the 1760s are designed with a similar formula of meanders and smaller, stylized motifs. Meanders of this period are commonly arranged parallel to one another creating an asymmetry across the vertical axis of the fabric. This contrasts greatly with the rigid vertical symmetry employed in silk designs of the 1740s and early 1750s". 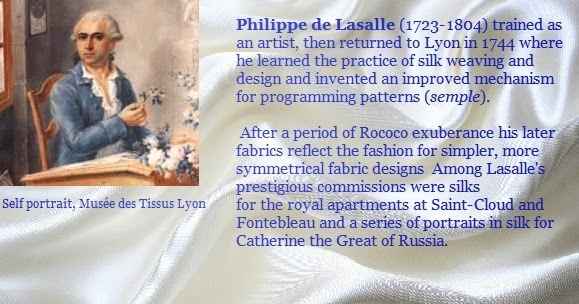 "The 1750s also marks the beginning of the career of Phillip Lasalle (1723-1804), another extremely successful Lyonnais silk designer who is credited with being the first to utilize the fur patterns that were extremely popular in the late 1750s and 1760s". "Owing significantly to the rediscovery of Pompeii and Herculaneum in 1748, neo-classical themes became increasing influential in textile design at the end of the eighteenth century. While rsmall, stylized flowers emained, the meanders that were popular in earlier decades weregradually replaced by straight lines beginning in the 1760s. 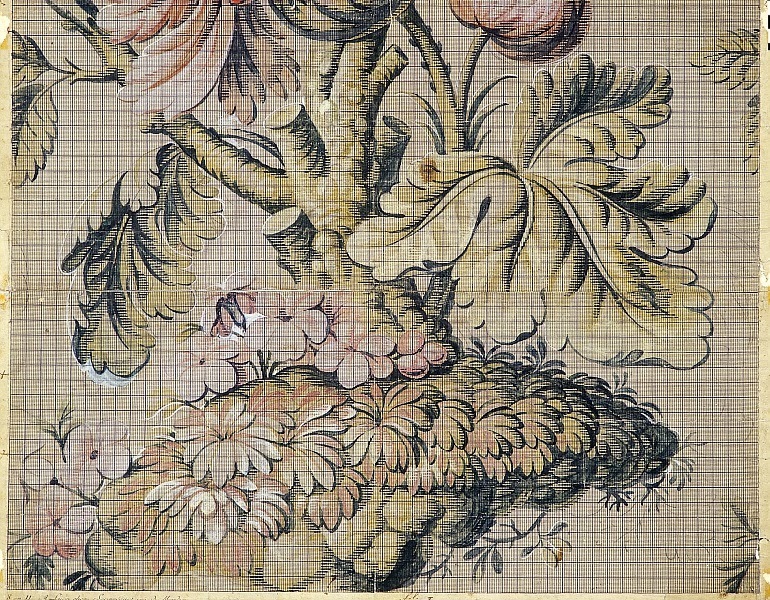 During the late 1760s meanders scattered with floral motif curled above or between rows of stripes. By the middle of the 1770s, the floral motifs that were once contained within meanders were now dispersed across or within stripes creating a stiffer composition that contrasts greatly with the airy designs that were popular earlier in the century". Kent State University Museum, "In bloom: patterned silk design innovations in eighteenth-century France" Exhibition March 6, 2008 - February 8, 2009 Guest curator, Elizabeth St.-George. Article on the new gallery at the V & A, The Guardian 15th January 2014. Ever wished you could walk the streets of an eighteenth-century town? Soon your wish can come true! Lyon en 1700 is an ambitious and ongoing project, launched in 2009 by 3D designer Fabrice Pothier in partnership with the Musées Gadagne and various Lyon archives and libraries. 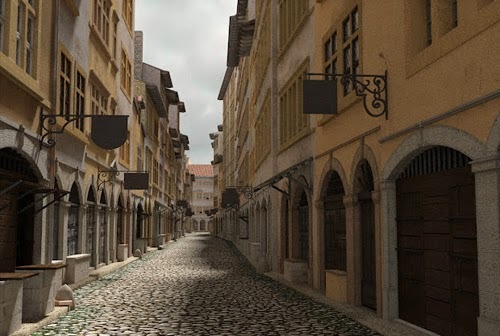 The project uses the modelling program Sketch Up to create a detailed virtual reconstruction of the historical centre of Lyon at the turn of the eighteenth century - quite a challenge as most of the buildings have long since disappeared. Eventually you will be able to enjoy a Google street-view type experience of the early 18th century, with links to documents and pictures from the museum and archives. Here is a trailer for a six-minute film produced by the project for the exhibition Lyon au 18e, un siècle surprenant, Musées Gadagne, Nov 2012-May 2013.